This project comprises residential and retail components on six plots in Zone E (plots E-24 to E-29) of Palm Jebel Ali’s eastern crescent. 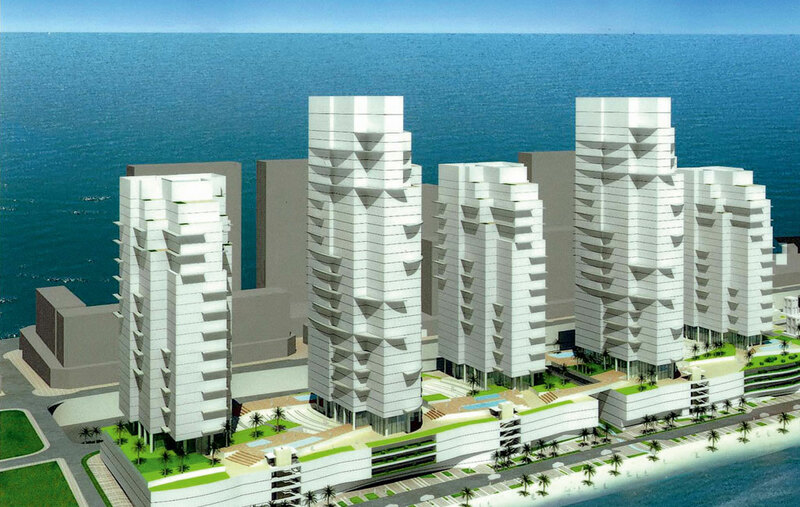 Diar Consult was appointed by Nakheel in June 2008 to prepare feasibility concept proposals for this mixed-use project. Due to the project size, Diar Consult partnered with Tange Associates Japan which led the pre-concept feasibility proposals, while Diar Consult acted as associate architects. With its wave-like curved podium, the design aims to create a resort image and feel. The staggered layers of the buildings create a dramatic appearance. The promenade front of the podium integrates duplex townhouses, situated above the retail floor. While the proposals were completed in August 2008, the Palm Jebel Ali project was put on hold owing to the global financial downturn.